UNCW NAMEPA celebrates World Ocean Day! Happy 2018 World Ocean Day! 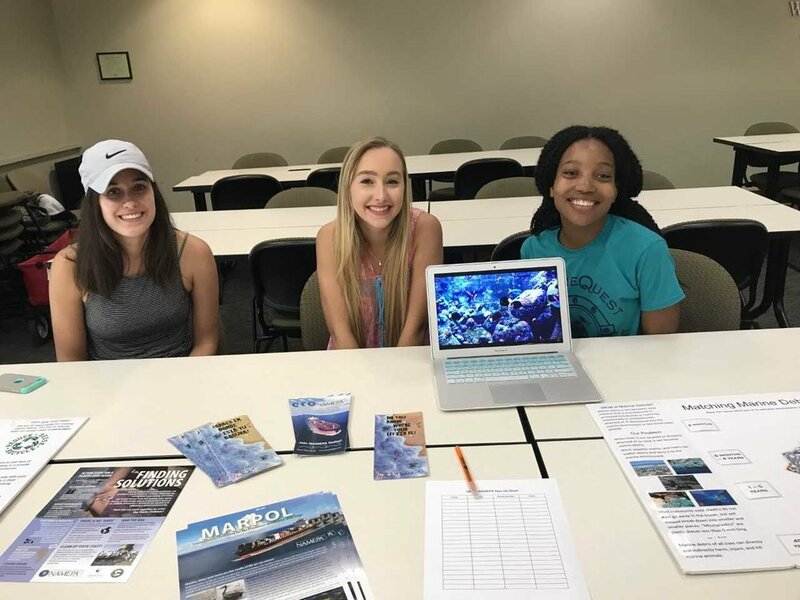 The University of North Carolina at Wilmington’s newly formed chapter of UNCW NAMEPA helped celebrate World Ocean Day at a special event on campus June 8th. UNCW NAMEPA’s leadership participated in the event to help educate families in the community. We had a great time with the families who came to this special event! We were able to teach people of all ages how long certain types of trash remain in the ocean by having them play a matching game thanks to supplies provided by NAMEPA and Marine Quest. UNCW NAMEPA would like to say a huge “thank you” to the staff at Marine Quest for inviting us to have a table set up at their World Ocean Day event. We believe it’s important to partner with other like-minded organizations, like Marine Quest, to make the greatest impact. NAMEPA is a wonderful organization, and we can’t wait to see UNCW students join us in the fight to save our seas and educate our community. For more information about our organization check out our sites! 268,940 tons of plastic float through the world’s oceans, spreading, accumulating, and being swallowed or absorbed. A group of researchers led by Markus Eriksen of the Five Gyres Institute in LA made this estimate in 2014. 5.25 trillion plastic particles are sitting in the ocean, they wrote in their paper, which was the first ever estimate for the total amount of plastic in the ocean.